The Douro valley in northern Portugal has more than just the perfect climate and soil for cultivating grapes and a wine-producing culture that dates back centuries. The undulating curves of the Douro wine region’s hillsides create a beautiful and dramatic landscape which changes with the seasons and is so special it was awarded UNESCO World Heritage status in 2001. There are plenty of things to see and do within the Douro and ever-increasing ways of experiencing all the region has to offer in terms of food, wine, scenery, culture and history. In this guide to visiting the Douro Valley I’ve attempted to help you decide when to go, how to get to and around the Douro and other practical details to help you make the most of whatever time you can spend here. 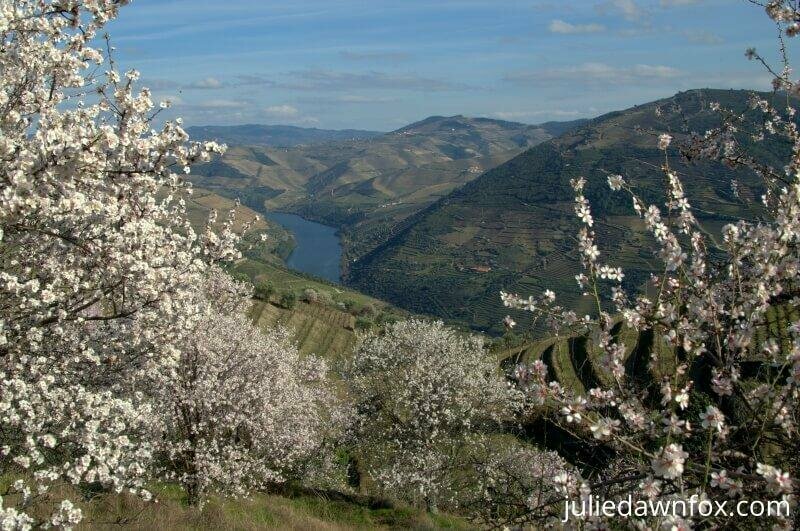 While the Douro vineyards are no more than dark gnarly stumps in late February and March, there are clouds of pink and white almond blossom to brighten up the hillsides. This is a great time of year to visit the Upper Douro and the area around Foz Côa, which gets far too hot in summer to do it justice. There’s also plenty of activity with vines being trimmed and treated in preparation for the next crop. From April, the emerging leaves gradually transform the hills until they are covered with ribbons of green. If you’re interested in walking or cycling in the Douro, spring (April to June) or autumn (September to November) are the best times to come both in terms of colourful scenery and comfortable temperatures although there’s a risk of rainy days. The micro climate in this wine region means that temperatures in July and August are often in the high 30ºCs or even hotter so not ideal for walking, especially in the afternoons. If you want a hands on experience of the Douro grape harvest, mid to late September is the time to come. You can pick grapes and even crush them by foot in some vineyards. After the harvest, a warm metallic colour scheme starts to take over with gold, copper and bronze tones decorating the slopes. By late October and into November, the autumn colours are at their best – a great time for photographers to visit. Come December and the olive harvest is underway, another important crop for this region. Some of the major hotels and wine estates (quintas) have special Christmas and New Year programmes for the festive season. See this article for more about the best time to visit Portugal. There are three main ways of exploring the Douro valley: by road, rail or river. If you have several hundred euros to spare you can also rent a helicopter but I’ll focus on the more affordable options here. 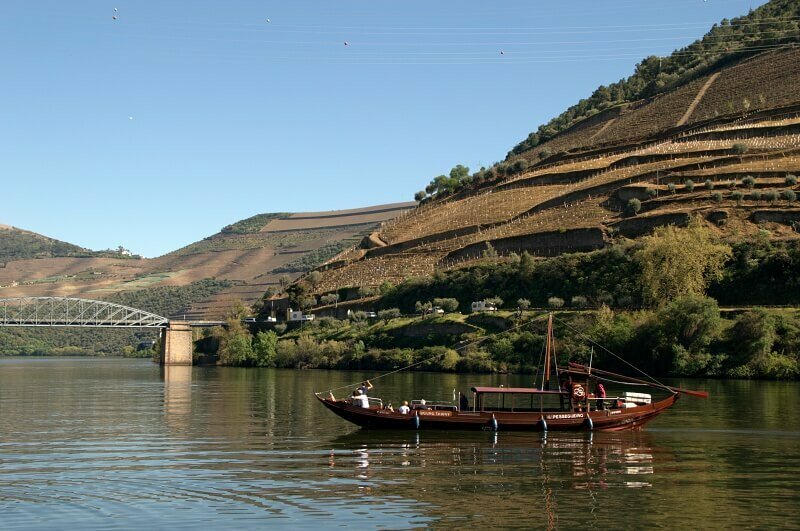 Douro river cruises can last from an hour to one or more days, with or without meals, drinks and vineyard visits. There are overnight boat tours where you sleep in a hotel and week-long cruises with accommodation on board. Note: If you’re new to multi-day river cruising, here are some points to consider before booking. If your time is limited, rather than spend most of it on a boat, I would be inclined to go with a tour that includes a shorter boat trip in the heart of the Douro Valley. Several full day small group tours from Porto include the opportunity to take a 1-hour boat trip from Pinhão as well as great views, winery tours and lunch, enabling you to get a broader experience. This tour would be my first choice so check availability. The tour operator strives to ensure that you avoid crowds and visit some great wineries. The boat trip is optional – you can add it during the booking stage. These do tend to be long days, with tours often lasting around 10 hours so if you’d prefer a more leisurely experience, try their Relax Douro programme. 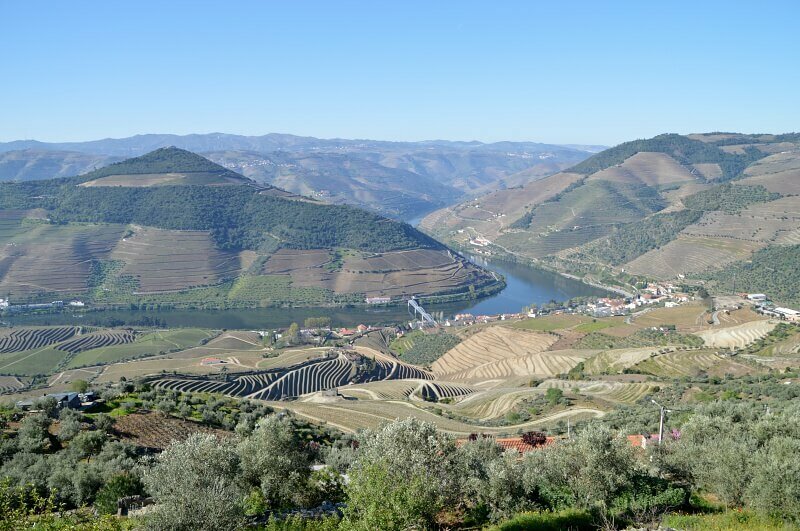 If you’re looking for a private tour of the Douro Valley, click here and complete the form to tell me what you’re interested in so that I can connect you with the most suitable tour operator. Some of the 1-day Douro boat tours from Porto combine rail and river so you go one way by boat and return by train. Or vice versa. The scenery gets better once you get towards Mesão Frio and beyond Régua, which is towards the end of the journey unless you go to Pinhão. These cruises only operate between April and October. Note that day cruises to/from Porto can be quite busy and noisy in peak season, so it might be preferable to make your way into the Douro wine region by other means and take a 1 or 2-hour boat trip in the midst of the more spectacular scenery, e.g. on a private sailing boat or simply a shared wooden rabelo boat upstream from Pinhão. If you feel like taking control and being even closer to the water, you can even rent a boat or a kayak. Most Douro tours will involve tastings of port and DOC Douro table wines if not meetings with the wine makers. Private tours can be tailored to you suit your interests so don’t worry if you don’t really like port wine or want to have lunch in a special place. Read this post for more information about a luxury day in the Douro. If you’re interested in the history and culture of the region, try to find a tour that includes a stop in a town like Amarante or Lamego as well as a wine tasting session at a winery. Note that almost all of the small group tours start and end in Porto so if you’re already in the Douro and looking for a guided tour, your options are limited to mostly private guided tours. This tour starts and ends in Regua, which is easy to get to by train. It takes you to a family run winery with great wines and views and another spectacular Douro viewpoint. If your budget is limited or you simply don’t fancy an organised tour, my guide to a do-it-yourself day in the Douro wine region gives you the information you need to see the highlights without the need for a car or a tour. I’ve included several options for upgrading your experience if money isn’t so tight. One advantage that the train has over driving is that the train tracks often hug the banks of the Douro River. So close, in fact, that you can see people fishing. The views become appealing about an hour outside Porto and most scenic as you approach Régua and continue further upstream. The scenery changes again the further along the Douro you get. The quinta (wine estate) signs become further apart and the landscape more barren but still impressive. 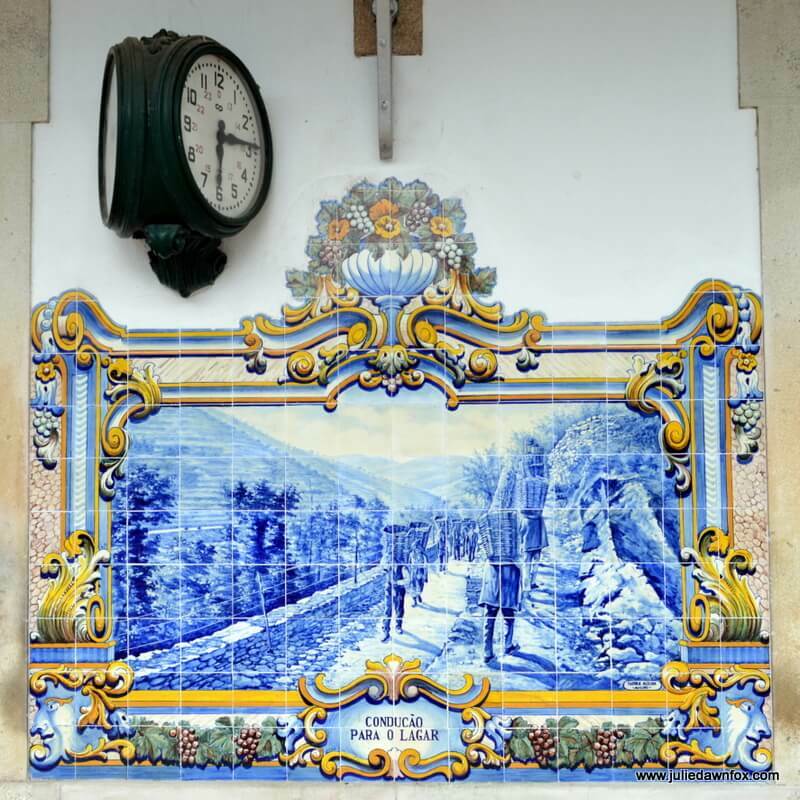 In the summer, there’s a special historical train which runs between Régua and Tua on Saturday afternoons with entertainment and light refreshments plus a little free time at Pinhão so you can stretch your legs and admire the beautiful azulejos that cover the station walls and maybe grab a glass of wine at one of the riverside cafés. Insider tip: If you board the train before Ferradosa, try to get a window seat on the right hand side of the train for the best views of the river, the hills and the wine estates through the rather grubby glass. Once the train crosses the river, you should switch to the left side of the carriage. Insider tip: When searching the train website for timetables, don’t use the accents on place names, e.g. Porto – Sao Bento, not São Bento. If you choose to explore the Douro by car, you’ll be rewarded with spectacular views of the valley. However, if you’re the one behind the wheel, you’ll need to keep your wits about you and eyes firmly on the winding narrow roads. You can always park up and admire the scenery from one of several viewpoints (miradouros) such as the Miradouro de Assumadouro, Casal de Loivos or Miradouro de São Leonardo da Galafura. If you have a car, you’ll also have more choice over which wine estates you pop into for tours and tastings, although you’ll need to be very careful not to drink much if you’re the driver. It will also give you the freedom to discover some of the Douro wine villages. More information in this post: 6 Traditional Wine Producing Villages In The Douro Valley. My favourite of these is probably Favaios, for several reasons. For scenic drives, the N222 between Pinhão and Régua was voted the World’s Best Drive in 2015 but if you have time to spare, it’s worth continuing to São João da Pesqueira and the Miradouro de São Salvador do Mundo. I’d also recommend the N101 from Régua through Mesão Frio in the direction of Amarante and the N322-3 between Pinhão and Alijó. There are several walking trails within the Douro wine region, some planned and marked out by the local councils, others provided by the wine estates themselves. You can ask at the local tourist information office for route leaflets but to be honest, they are often less than helpful and it’s very easy to get lost. If you simply want to walk in the vineyards for up to a couple of hours, you’d be better off getting a map from one of the quintas (wine estates) or going through a tour operator. Several tour companies offer self-guided or guided walks in the area ranging from half a day to multiple days – let me know if you’d like me to connect you with one of them. Or read about my experience of a week-long self-guided walking holiday. Do bear in mind the weather conditions if you’re thinking of walking in the Douro Valley or the Alvão and International Douro natural parks. In summer, it really isn’t advisable or pleasant because of the extreme temperatures and lack of shade while winter weather can be quite grim. If you’re staying at one of the quintas (wine estates) in the area, they may have bikes for rent and be able to suggest suitable routes for you, or include a bike tour as part of their package. It’s also possible to hire bikes for short periods from some of the tour operators in Regua and Pinhão. That said, unless they can suggest a safe, off-road route, I wouldn’t recommend this for novice cyclists planning to stick to the roads, mainly because of the traffic and hills. This is not the wine region for leisurely bike rides between wineries. Note: I am not a confident cyclist so I am somewhat biased. For more serious, experienced cyclists, there are specialist tour companies which cater to cyclists with or without their own bikes. If you have flexibility in your itinerary, my recommendation would be to spend at least one night within the valley to avoid a long, tiring day trip and to better appreciate the landscape, culture and gastronomy that this beautiful area has to offer. This gives you greater flexibility to visit different wineries, villages and historical sites as well as take a boat trip, walk or have a picnic in the vineyards or simply relax and enjoy the views. Ideally, you should try to find a room on a wine estate (quinta) but where you stay will depend on how you’re getting around. If you rent a car, you will have more options but even by public transport and with the help of local taxi services, you can find some special places to stay in the Douro. 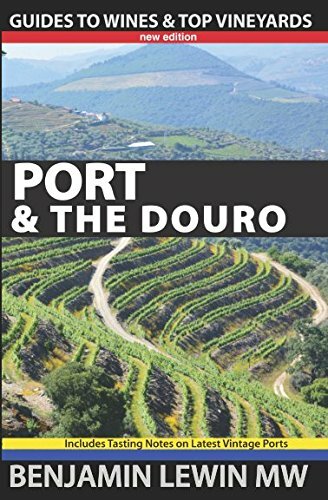 See my comprehensive guide to best places to stay in the Douro or read on for a few suggestions in the most convenient locations. While the town of Peso da Régua is not particularly inspiring, it has plenty of restaurants and a train station, making it a possible base, especially if you don’t have a car. I loved Casa de São Domingos, which is just outside the centre of Régua but still within walking distance. The beautiful building is tastefully decorated with quality traditional furnishings. There’s a pool and breakfast is plentiful. Click to see prices, photos and availability. Quinta da Pacheca is a €5 taxi ride from the train station and the historical building is surrounded by vineyards. They have bikes for guest use and an award-winning onsite restaurant. Once there, they have a range of wine and food-related activities so you may not wish to leave! Check prices and availability. Quinta de Tourais is next door to Quinta da Pacheca and with only two rooms, the experience is quite different. This is a fully operational small scale winery with an arty character and plenty of personality. There’s a small rooftop pool and possible access to the kitchen but it would help to have a car if you stay here. Check photos and availability. If you want the ultimate in luxury surrounded by vineyards, the Six Senses Douro is the place to be. With a wine library boasting 750 vintages, onsite spa, gourmet restaurant, yoga and wellness programmes and sumptuous rooms, it’s wise to factor in plenty of time at the hotel. A car would help if you want to be independent but transfers and tours can be arranged if you’d rather not drive. Check out the luxury options here. Quinta do Vallado is delightful design hotel built from schist stone with tasteful, comfortable and clean modern rooms, onsite restaurant and outdoor pool. They offer cellar tours for guests and free parking. Some rooms have river views. Find a room with a view. Another possible base with a few restaurant options and easy access to wineries and boat trips is the village of Pinhão, another 30 minutes upstream. It has a beautifully decorated train station and pleasant riverside area although the village itself is rather drab. It’s easy to overlook that when you see the views and if you don’t have a car, it’s an easy option. Quinta de la Rosa is technically within walking distance of Pinhão train station although I’d take a taxi if you have luggage. A working winery with privileged views of the Douro, especially from the restaurant and pool, they offer beautiful rooms and suites at a reasonable price. Check options and availability. If you have a car, or are happy to spend most of your time enjoying the spectacular views, vineyard walks, bikes, restaurant, pool and other facilities, Quinta Nova Luxury Wine House would be the perfect place to stay, assuming you’re lucky enough to find availability. They offer transfers to the train station so a lack of transport isn’t an issue. Check availability and prices. If you crave 5-star luxury and would rather be next to the Douro River and able to walk to wineries and restaurants, The Vintage House Hotel is for you. Recently renovated, this 18th century building offers every comfort you’d expect and overlooks the famous river, as does the outdoor pool. Check prices and availability. If you’re on a tighter budget and can handle a few steps to get to your self-catering apartment, Casas Botelho Elias offer studios, 1 and 2-bedroomed accommodation with a pleasant shared terrace or private balcony. Check options and availability. These are just a few of the more conveniently-located places to stay in the Douro Valley. There are many other delightful properties to choose from but the key, especially in May and September, is always to book ahead. Hi! Can you advise on wine tours departing from the Douro Valley and not Porto? The link above took me to tours from Porto only. Thanks! I’ll send you an email as it depends on your budget and what you want to do. My boyfriend and I will be in Porto March 7-10 and want to visit the Douro Valley. Our plan was to go by train and spend one night, preferably at a vineyard. Is it possible to get there by train at this time with the construction? If so, where would you suggest we travel to, which wineries would you visit, and where would you suggest we stay? Thank you! I will be in the Porto area from March 7-14, 2019. 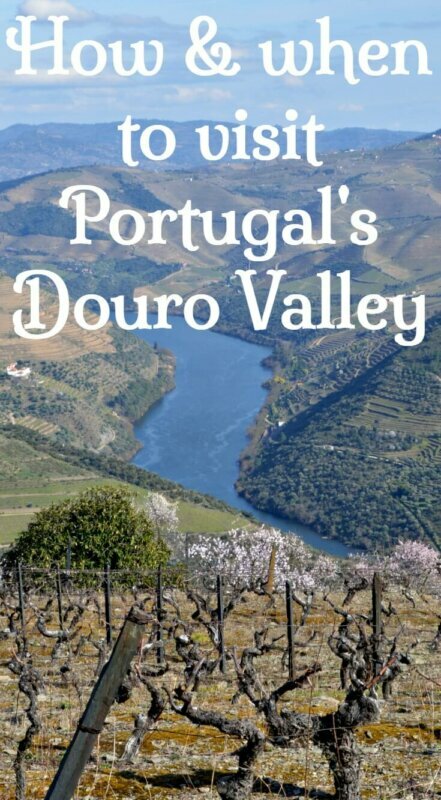 I am interested in taking a tour to the Douro Valley.I noticed that you included 2 tours by Get Your Guide. What is the difference between the Douro Valley Tour vs the Douro Valley Excursion? They both seem to offer wine tasting, river cruise and lunch. I would appreciate any suggestions you might have. Hi Julie , Thanks for great article. 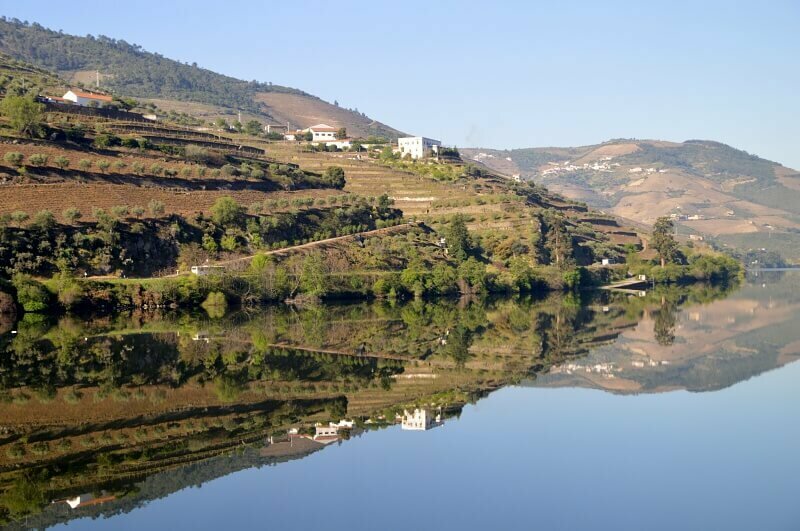 We are planning a trip to the Douro in May and are thinking of chartering a private boat. We are boaties and have 1 in mind. Wondering what you think about only visiting the places on the river ? Perhaps a day trip from 1 of the riverside towns ? And do you know if it’s possible to moor the boat just along the river bank or are there public wharfs ? I would love to do a train ride as well , can you recommend the prettiest section to maybe do return for a riverside town ? Thanks so much ! Hi. My husband and I will be visiting Portugal last 2 weeks in January. Are wineries opened to visitors in the Douro Valley. How is the weather during January. Thank you. January weather is likely to be cold and potentially rainy and there is a chance that some of the smaller quintas will close for the winter in terms of tourism so contact them ahead of time to check. The main players will be open, e.g. Quinta do Bomfim and Quinta do Seixo. Hi Julie,you mentioned miradouro de assumadouro in your blog. I cant seem to find its location. Can you tell me where it is or how to get there please? Hello, thank you for all this great information! I know nothing about Northern Portugal, but am traveling from New York City to Porto for a friends wedding in early September. My wife & I are considering checking out Duoro Valley for a 1-2 days, and possibly Lisbon & Algarve. We took 11 days off work to have flexibility, but need some guidance on a itinerary. Do you have any suggestions / tips for us? While in Duoro Valley we want a nice relaxing place, but not sure if there’s any cool bars/restaurants that cater to nightlife. Hi. Can you please give me an advice. I am planning to drive from Porto to pinhao. Google shows to take road a4. Is that a good option as far as scenery or I should drive on a different road? A4 is a motorway so not all that scenic. I suggest leaving the motorway at Amarante and driving along the winding N101 to Mesão Frio then on the N222 to Pinhao. Perfect. Thanks so much. Also in pinhao, should I do 1 or 2 hour cruise. I know it will be beautiful but I am afraid that if its 2 hours it might get boring. Hi Julie, we will be driving for a half day trip to Pinhao, and I cant seem to find any info on just vineyard tours. Im not looking for a guided tour. Can you just arrive to the vineyard of choice, and pay to tour it? Also do you have any recommendations for a estate that has olive oil and wine? Hi Cathy, you usually need an appointment for tours and tastings at individual wineries – they need to make sure they have staff on hand to receive visitors etc. Contact the wineries directly to sort this out. I am planning a trip to duoro mid November… I know it is past harvest but is there still an opportunity to tour the vineyards, have lunch, take a walk? or do they close for the season? Hi Ali, Most of the vineyards are open year round to visitors – book ahead to be certain. Thank you for this amazing post, it’s been really helpful for planning our day trip to Douro Valley. Can you tell me if Google Map is right about the fact that it’d take approximately 1h30 to get to St Leonardo de Galafura from Porto (if we take the shortest itinerary, so highway A4 + N313) ? I know we have to calculate more time while driving in the hills in the Valley but I was wondering if that’s also the case with the A4. We have a dinner reservation in the Valley but we need to drive back to Porto after so we just want to make sure it won’t take us something like 5-6 hours to get home. Also, if we drive at a normal speed in a road like the N222, let’s say Google Map says it’s a 40 minutes drive between two quintas, do I need to multiply by 2 to get a good idea of the real time it’d take or it’s more/less than that? Hi Ariane, I’d always add a little extra to the estimates provided by Google but they’re not usually too far out. The A4 is fast-moving unless you hit traffic in Porto. I’m going to be visiting Porto with a friend for a few days in August. We’re doing a day trip to Douro Valley and have a few quintas picked out as well as lunch at a quinta. We’re hoping to take the train to Regua and then taxi/uber between the quintas (all along the same side of the river on the way to Pinhao but not the side with the train) and then take the train back to Porto from Pinhao. Would you say that it’s fairly easy to get taxis/uber in this area? Uber works in Porto but not in the Douro. There are taxis waiting outside the train stations in Regua and Pinhão. Get a number from the one you use so you can call them to collect you (cheaper than having them wait) or ask the quinta to call one.